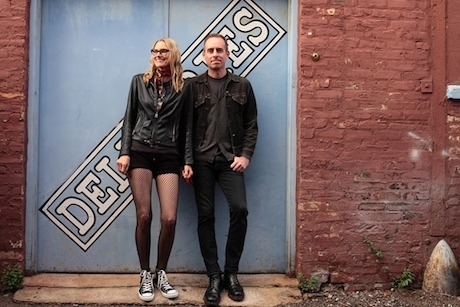 Last February, American singer-songwriter Aimee Mann and punk-pop performer Ted Leo announced that they'd formed a new collaborative project. Initially thought to be called #BOTH, they've simplified to just be called the Both and have announced their debut album. Initially planned as a six-song release, the release has been expanded into a full-length that will arrive on April 15 via Aimee Mann's own SuperEgo Records. The duo have shared the first song from the album. Called "Milwaukee," it's a guitar-heavy power-pop jam that sees both performers trading vocals. The track can be streamed below. Speaking with Rolling Stone, Ted Leo explained that the song was inspired by a statue immortalizing Happy Days' classic rock dude. "Walking along Milwaukee's riverfront between sound check and show time last year, Aimee and I were startled by a very disconcerting bronze statue of Arthur Fonzerelli, a.k.a. 'The Fonz,' a.k.a. 'The Bronze Fonz,'" he said. "In that very moment, we knew we had to start a band to immortalize it (more than a bronze statue already immortalizes something), and the Both was born." He continued, "I think the song is a pretty good representation of how our writing meshes on this project — solid melodies and tight harmonies, forward movement but not going off the rails, some busier rocking parts meeting some spookier atmospherics, etc. And it speaks specifically of our friendship and some of the things that honestly did lead us to want to begin writing together." Stay tuned for more information on the Both's self-titled debut as it becomes available.